Wow, talk about an eyeshadow that’s packed with color! 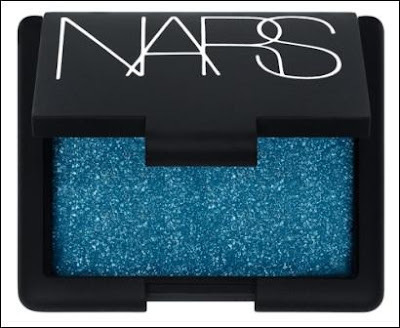 NARS Single Eyeshadow in Tropic is a richly pigmented TEAL blue loaded with silver glitter. A word to the wise? It's not for the faint of heart. I actually LOVE this color and got used to the intensity pretty quickly, but when I met my friend at a café, she exclaimed how “dressed up” I looked. We broke it down. Okay for dinner, okay for fashion job, okay for vacation, definitely excellent for a night out. Not okay for corporate ladder-climbing job or job that requires standing in front of a classroom, not okay for interviews, not okay for the gym. 1) Apply foundation last. This shadow is heavy on the glitter and the silver particles created a disco ball on my nose and cheeks after applying. A swipe of a cotton ball and tinted moisturizer fixed the 70's effect. 2) I mixed in a bit of mauve-brown shadow to tame the brightness. I did a gentle layer of NARS Tropic all over the eye, lightly went over the outer half of my eyes with a soft brown, and then dabbed in another layer of NARS Tropic from lash to crease. The effect was an aqua blue smoky eye that was bright enough for the day. 3) I wanted to balance out the bright pop of color on top of the eye with a little color on the bottom. It’s a bit tricky, since too much blue beneath the eye emphasized bags. It’s prettiest to just dab color on the lower, outer corner and blend inward with a Q-tip. 4) Once you’re done, keep hands away from eyes! Unlike a more natural color, when this smears, you’ll look like a smurf caught in the rain. The verdict -- gorgeous color but takes some experimenting to make it wearable for day. Probably my favorite night color yet! NARS Single Eyeshadow in Tropic retails for $22. what a great feature! Interesting write up too - if you can post a picture, that'd be even better!! Most turquoise colors are tricky because they make you look like you have double eyes. I have wanted a blue that is beautiful and vibrant and have struggled with it because they tend to look muddied down when applied. Gorgeous in the case but not true to color when on eyelid. Then we have a beautiful shade like this and it may be TOO true to color! LOL. I might have to pass! I am eager to try Lancome's Indigo having seen some swatches of it. I really like this feature on your blog. This color's gorgeous.